MSU alum Russ Webster (MPA ’81) has dedicated his life to “doing good” around the world. While based out of Washington, D.C., over the last three decades he’s worked in 45 countries, on issues as varied as national-level regulatory reform to village agriculture. He speaks Bangla, German, some French, and “can even still do a Michigan accent.” Webster, who we profiled on the MPP blog last year, recently spent a day in East Lansing networking with students and sharing insights about working in the exciting field of international development. “If this is a career you’re interested in, I strongly encourage you to pursue it,” he told students. “The intersection between evaluation and communication is becoming a more and more prominent factor in international development,” Webster said. Taxpayers and donors to charitable foundations want to know if their money was used well, and as international development agencies create more “monitoring and evaluation” positions to “tell the story of whether projects are successful,” the rigorous, quantitative program-evaluation skills MSU MPP students are acquiring are increasingly in demand. Webster says there is also growth in communications positions at international development agencies. “If you’re expecting to create a positive change, it’s only going to continue if the people you are helping really embrace” the program, he said. Thus, letting people know what the program is doing and why—communicating—has become a key element in achieving local ownership and empowerment. Webster also shared advice about how to ensure that international development projects are appropriate in the local context, and thus more likely to be successful and sustainable: Avoid going down overly technical “rabbit holes.” Make sure to include people with a wide variety of expertise and perspectives—and make sure to talk to people who live and work in the communities where the program will be implemented—to make sure your project design isn’t based on erroneous assumptions. Given some of the roadblocks the development projects can come across, students asked Webster, how does one make the case for international development aid to Americans who are skeptical? “I would emphasize the importance of creating good economic partners and of building strong, positive political relationships with other countries,” Webster said. He said that many international aid efforts are justified on humanitarian grounds—but promoting stability and prosperity around the world also benefits the U.S. economy and its national security. 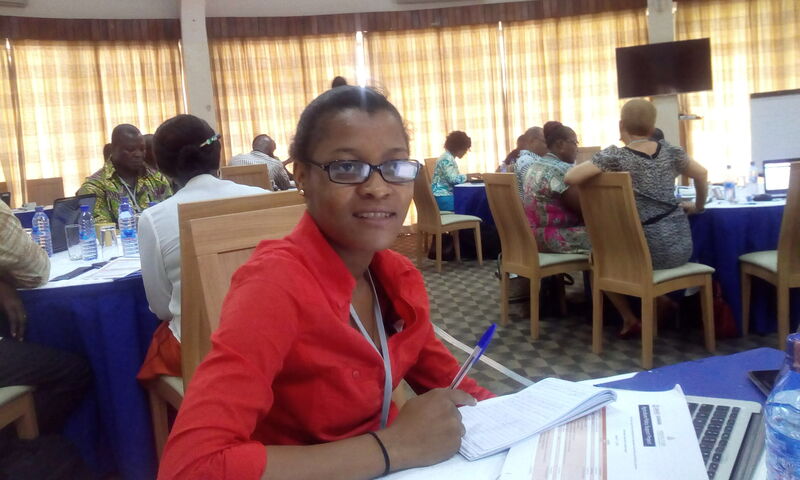 Eva Tetteh is a student in the Masters of Public Policy program at Michigan State University, interning with the USAID/Ghana Feed the Future Agriculture Policy Support Project. In Ghana, agriculture is recognized as the backbone of the economy providing food, income and employment to almost all its rural population. Chemonics International is implementing the USAID/Ghana, Feed the Future, Agriculture Policy Support Project (APSP), with a goal to improve the food security-enabling environment for private sector investment in agriculture, through evidence-based policy formation and implementation, strengthening research capacity and advocacy. APSP is working with the Ministry of Food and Agriculture (MoFA) and other institutions in Ghana, including the private sector, civil society organizations, and universities and research institutions to accomplish this goal. As part of her internship, Eva worked on setting up a database on all grantees’ activities. The purpose of this database was to help track the activities of grantees as well as monitor their progress. The database was divided it into three components: policy education, policy advocacy and policy dialogue. Currently, the project has sponsored six different organizations, which are educating farmers and input dealers at the grass root level to have in-depth knowledge about the various agricultural policies in Ghana. In addition, she reviewed literature on the agricultural data collection needs in Ghana. Her task was to identify the capacity gaps in agriculture data collection so the project team could design an intervention that would strengthen data capacity and train field enumerators to collect reliable and defensible agriculture data for the Statistical Research Information Directorate (SRID) of the Ministry of Food and Agriculture. Eva found that Ghana lacks reliable and defensible agricultural data, due to inadequate funds to conduct proper agricultural census and also lacks qualified enumerators to help collect reliable data. From this she has gained a great appreciation for the importance of well-collected data to support effective and evidence-based policy decision-making and implementation. Furthermore, she designed a questionnaire to assess the research capacity gaps of the staff at the Ministry of Food and Agriculture. The aim of the questionnaire was to help identify the research capacity gaps of the relevant government units in order to assist in designing interventions to help build their research capacity. Finally, Eva participated in the third year annual work planning retreat of the project. This was a three-day work plan, which brought together various stakeholders from both the public and private sectors to discuss the challenges confronting the agriculture sector and also propose solutions that will help resolve some of these problems. 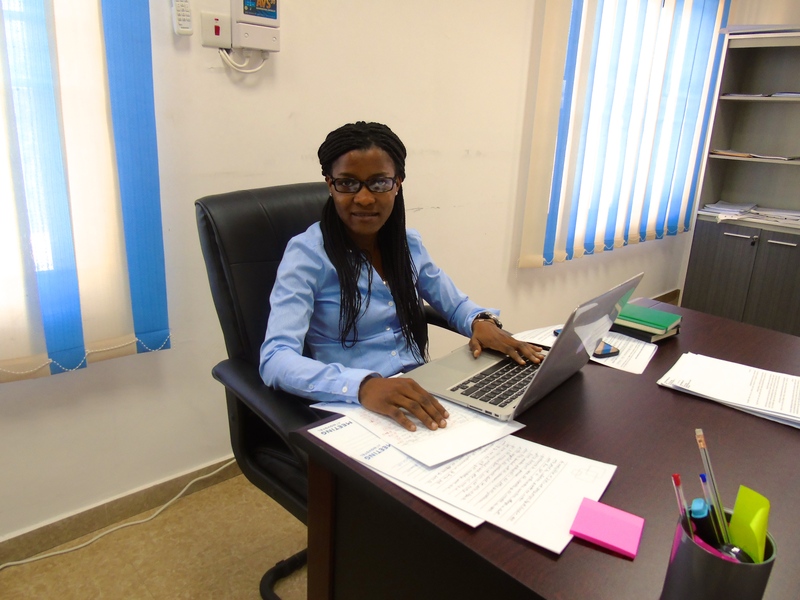 Through Eva’s internship, she has gained an in-depth understanding about the agricultural sector of Ghana. Participating in various dialogues on agriculture has helped her understand and appreciate the importance of this sector and in general the need to create a policy enabling environment to enhance private sector investment in agriculture.